Stars are born within the clouds of dust and scattered throughout most galaxies. A familiar example of such as a dust cloud is the Orion Nebula. Turbulence deep within these clouds gives rise to knots with sufficient mass that the gas and dust can begin to collapse under its own gravitational attraction. As the cloud collapses, the material at the center begins to heat up. Known as a protostar, it is this hot core at the heart of the collapsing cloud that will one day become a star. Three-dimensional computer models of star formation predict that the spinning clouds of collapsing gas and dust may break up into two or three blobs; this would explain why the majority the stars in the Milky Way are paired or in groups of multiple stars. The observations of Eta Carinae's light echo are providing new insight into the behavior of powerful massive stars on the brink of detonation. As the cloud collapses, a dense, hot core forms and begins gathering dust and gas. Not all of this material ends up as part of a star — the remaining dust can become planets, asteroids, or comets or may remain as dust. In some cases, the cloud may not collapse at a steady pace. In January 2004, an amateur astronomer, James McNeil, discovered a small nebula that appeared unexpectedly near the nebula Messier 78, in the constellation of Orion. When observers around the world pointed their instruments at McNeil's Nebula, they found something interesting — its brightness appears to vary. Observations with NASA's Chandra X-ray Observatory provided a likely explanation: the interaction between the young star's magnetic field and the surrounding gas causes episodic increases in brightness. A star the size of our Sun requires about 50 million years to mature from the beginning of the collapse to adulthood. Our Sun will stay in this mature phase (on the main sequence as shown in the Hertzsprung-Russell Diagram) for approximately 10 billion years. Stars are fueled by the nuclear fusion of hydrogen to form helium deep in their interiors. The outflow of energy from the central regions of the star provides the pressure necessary to keep the star from collapsing under its own weight, and the energy by which it shines. As shown in the Hertzsprung-Russell Diagram, Main Sequence stars span a wide range of luminosities and colors, and can be classified according to those characteristics. The smallest stars, known as red dwarfs, may contain as little as 10% the mass of the Sun and emit only 0.01% as much energy, glowing feebly at temperatures between 3000-4000K. Despite their diminutive nature, red dwarfs are by far the most numerous stars in the Universe and have lifespans of tens of billions of years. On the other hand, the most massive stars, known as hypergiants, may be 100 or more times more massive than the Sun, and have surface temperatures of more than 30,000 K. Hypergiants emit hundreds of thousands of times more energy than the Sun, but have lifetimes of only a few million years. Although extreme stars such as these are believed to have been common in the early Universe, today they are extremely rare - the entire Milky Way galaxy contains only a handful of hypergiants. In general, the larger a star, the shorter its life, although all but the most massive stars live for billions of years. When a star has fused all the hydrogen in its core, nuclear reactions cease. Deprived of the energy production needed to support it, the core begins to collapse into itself and becomes much hotter. Hydrogen is still available outside the core, so hydrogen fusion continues in a shell surrounding the core. The increasingly hot core also pushes the outer layers of the star outward, causing them to expand and cool, transforming the star into a red giant. If the star is sufficiently massive, the collapsing core may become hot enough to support more exotic nuclear reactions that consume helium and produce a variety of heavier elements up to iron. However, such reactions offer only a temporary reprieve. Gradually, the star's internal nuclear fires become increasingly unstable - sometimes burning furiously, other times dying down. These variations cause the star to pulsate and throw off its outer layers, enshrouding itself in a cocoon of gas and dust. What happens next depends on the size of the core. For average stars like the Sun, the process of ejecting its outer layers continues until the stellar core is exposed. This dead, but still ferociously hot stellar cinder is called a White Dwarf. White dwarfs, which are roughly the size of our Earth despite containing the mass of a star, once puzzled astronomers - why didn't they collapse further? What force supported the mass of the core? Quantum mechanics provided the explanation. Pressure from fast moving electrons keeps these stars from collapsing. The more massive the core, the denser the white dwarf that is formed. Thus, the smaller a white dwarf is in diameter, the larger it is in mass! These paradoxical stars are very common - our own Sun will be a white dwarf billions of years from now. White dwarfs are intrinsically very faint because they are so small and, lacking a source of energy production, they fade into oblivion as they gradually cool down. This fate awaits only those stars with a mass up to about 1.4 times the mass of our Sun. Above that mass, electron pressure cannot support the core against further collapse. Such stars suffer a different fate as described below. If a white dwarf forms in a binary or multiple star system, it may experience a more eventful demise as a nova. Nova is Latin for "new" - novae were once thought to be new stars. Today, we understand that they are in fact, very old stars - white dwarfs. If a white dwarf is close enough to a companion star, its gravity may drag matter - mostly hydrogen - from the outer layers of that star onto itself, building up its surface layer. When enough hydrogen has accumulated on the surface, a burst of nuclear fusion occurs, causing the white dwarf to brighten substantially and expel the remaining material. Within a few days, the glow subsides and the cycle starts again. Sometimes, particularly massive white dwarfs (those near the 1.4 solar mass limit mentioned above) may accrete so much mass in the manner that they collapse and explode completely, becoming what is known as a supernova. Main sequence stars over eight solar masses are destined to die in a titanic explosion called a supernova. A supernova is not merely a bigger nova. In a nova, only the star's surface explodes. In a supernova, the star's core collapses and then explodes. In massive stars, a complex series of nuclear reactions leads to the production of iron in the core. Having achieved iron, the star has wrung all the energy it can out of nuclear fusion - fusion reactions that form elements heavier than iron actually consume energy rather than produce it. The star no longer has any way to support its own mass, and the iron core collapses. In just a matter of seconds the core shrinks from roughly 5000 miles across to just a dozen, and the temperature spikes 100 billion degrees or more. The outer layers of the star initially begin to collapse along with the core, but rebound with the enormous release of energy and are thrown violently outward. 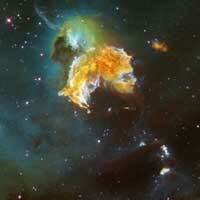 Supernovae release an almost unimaginable amount of energy. For a period of days to weeks, a supernova may outshine an entire galaxy. Likewise, all the naturally occurring elements and a rich array of subatomic particles are produced in these explosions. On average, a supernova explosion occurs about once every hundred years in the typical galaxy. About 25 to 50 supernovae are discovered each year in other galaxies, but most are too far away to be seen without a telescope. If the collapsing stellar core at the center of a supernova contains between about 1.4 and 3 solar masses, the collapse continues until electrons and protons combine to form neutrons, producing a neutron star. Neutron stars are incredibly dense - similar to the density of an atomic nucleus. Because it contains so much mass packed into such a small volume, the gravitation at the surface of a neutron star is immense. Like the White Dwarf stars above, if a neutron star forms in a multiple star system it can accrete gas by stripping it off any nearby companions. The Rossi X-Ray Timing Explorer has captured telltale X-Ray emissions of gas swirling just a few miles from the surface of a neutron star. Neutron stars also have powerful magnetic fields which can accelerate atomic particles around its magnetic poles producing powerful beams of radiation. Those beams sweep around like massive searchlight beams as the star rotates. If such a beam is oriented so that it periodically points toward the Earth, we observe it as regular pulses of radiation that occur whenever the magnetic pole sweeps past the line of sight. In this case, the neutron star is known as a pulsar. If the collapsed stellar core is larger than three solar masses, it collapses completely to form a black hole: an infinitely dense object whose gravity is so strong that nothing can escape its immediate proximity, not even light. Since photons are what our instruments are designed to see, black holes can only be detected indirectly. Indirect observations are possible because the gravitational field of a black hole is so powerful that any nearby material - often the outer layers of a companion star - is caught up and dragged in. As matter spirals into a black hole, it forms a disk that is heated to enormous temperatures, emitting copious quantities of X-rays and Gamma-rays that indicate the presence of the underlying hidden companion. The dust and debris left behind by novae and supernovae eventually blend with the surrounding interstellar gas and dust, enriching it with the heavy elements and chemical compounds produced during stellar death. Eventually, those materials are recycled, providing the building blocks for a new generation of stars and accompanying planetary systems.